Internal emails leaked to Bloomberg News have shown that Wal-Mart executives are worried about a rise in payroll taxes and a delay in tax returns. But these aren’t the only major issues that Wal-Mart faces. “The company’s problems run much deeper,” write the analysts at Tiburon Research Group’s Retail Geeks. It’s still not clear if Wal-Mart’s price investment, which should drive traffic into its stores, is actually working, according to Tiburon. See, back in Q1 2012, Wal-Mart announced a new initiative. It would invest in price at both Walmart and Sam’s Club in order to drive traffic into its stores. 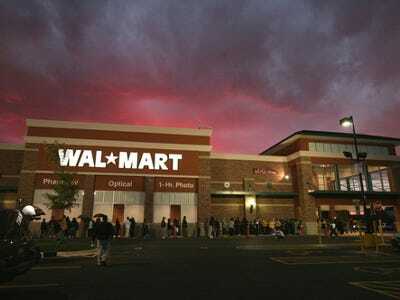 It promised to pump $2 billion into retail pricing, then later in 2012, Wal-Mart upped that number to $6 billion. And yet, Walmart store traffic slowed down in Q2 and Q3 relative to Q1. So there’s a big question that needs to be answered: Is Wal-Mart’s price investment actually effective? Here’s the problem, following 4 consecutive quarters of improved traffic (Q4 2011 through Q3 2012), the core chain lapped an increased level of traffic in Q4 2012. Coinciding with the anniversary of an increased level of traffic at the core chain, the company planned for a much larger marketing spend in Q4 2012 (radio/TV). Therefore, it will be interesting to see if the core chain’s traffic improved in Q4 2012 versus LY. If not, FY 2013 is setting up to be an ugly year for WMT. There are some fundamental concerns about the health of Wal-Mart’s core customers. Wal-Mart’s price investment is meant to help curtail that problem and it may not be working. One thing’s for sure — Wal-Mart’s Q4 earnings will be very interesting come Feb. 21.